So many of you are learning about color and all the implications it can have in a space. 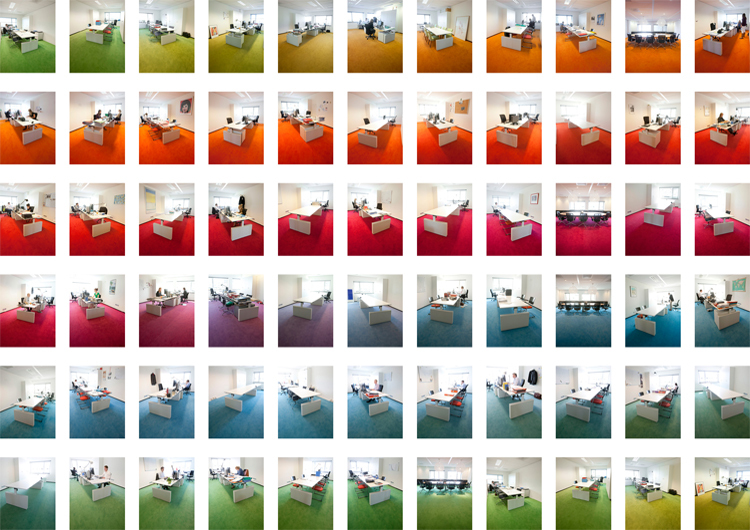 I came across the DLA Piper office by HofmanDujardin in the Netherlands that takes color changing to a whole other level. 5 Responses to "Color Changing"
What an awesome combination of color and interior lighting. I think it would be a fun envirnment to work in with all the color variations. This is a really amazing building. I would love to work in an environment like that. It’s impressive how they did so much with paint alone. This is a good lesson on how we can be creative with limited means an excellent skill for a designer! I find this simple concept to be so fascinating. I would have never thought of this idea. If I were to work in that building I would prefer to be in the “blues” section. This is probably because we are so used to working in offices or classrooms that are carpeted with grey rugs and painted beige or white walls. I would find the bright color greens, oranges, reds, yellows and pinks to be too distracting of an environment to work in. I actually saw this on Yahoo! not too long ago. It reminds me of Lisa Frank (I know what you’re thinking), but you have to admit the colors excite you! I wonder if the employees get to pick where their desk is or if they are allowed to rotate based on their mood? Personally, I would like to be surrounded by magenta, fuchsia, or cerulean (my favorite color since I discovered something other than basic blue). They give me a since of passion and calm which I could really use in my life. Ha!